Germany and France are aiming to agree on plans for a “banking union” and further Eurozone reform by March next year, as the bloc races towards deeper integration following the Brexit vote. Speaking alongside German Chancellor Angela Merkel, French President Emmanuel Macron restated his desire to create a European Union (EU) Finance Minister to be responsible for a joint eurozone budget. She said there was agreement that “we aim for a banking union” and that finance ministers would negotiate the steps to advance that project, Politico reports. 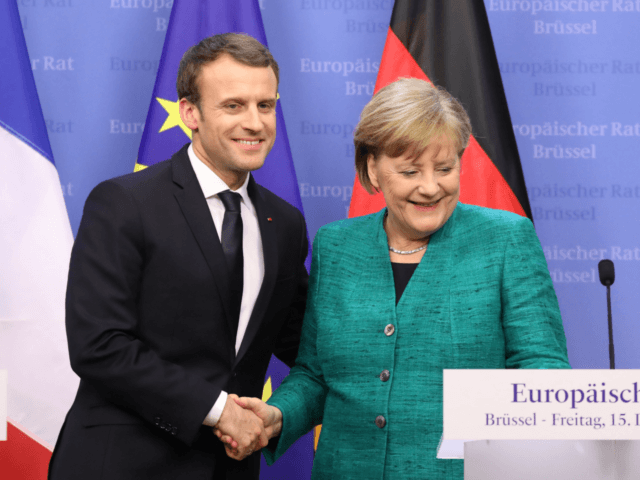 Shortly after the German election in September, President Macron gave a landmark speech where he called for widespread European integration and the creation of financial institution necessary for forming a superstate. With the Commission having attempted to keep plans for an EU Army secretive before the Brexit vote, after the referendum, in June, European Commision President Jean-Claude Junker was frank about his ambition in his ‘State of the Union’ speech. Earlier this month, Martin Schulz, the former President of the European Parliament and contender to be Chancellor Merkel’s coalition partner, called for a new “European Constitution” and the creation of a “United States of Europe” by 2025. He said the EU should rapidly expand its power and erode the sovereignty of nation-states, and that any country standing in the way must be ejected from the bloc.